Martin Luther and the Protestant “Reformation” – or rather, “the Deformation” Just back from a trip to Martin Luther sites in Germany, Steve Ray discusses the man, his ideas, and his effect on the Church. 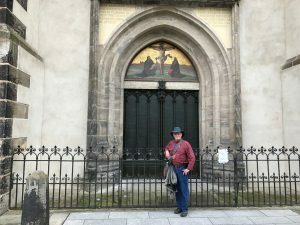 (PICTURE: Steve posting “500 Reasons to Be Catholic” on the Wittenberg Door in Wittenberg Germany. To watch the 2-minute video of the event, click here. 1. Regarding the “reformers”, Romans 8 sounds like predestination so can Steve please give some clarification on that topic? 2. In recent times the Pope and others honor Martin Luther? Is the Pope a heretic? How should we respond? 3. What does it mean for the Church to be “apostolic”? How can I explain it to my Protestant friends who think they have it too? 4. Why didn’t the Church stop Luther? 5. The Church was corrupt at the time of the Reformation which is why Luther was able to do what he did, correct? 6. What is the definition of a heretic? How are Protestants not heretics if they believe what Luther believed? 7. Did the Catholic theologians of the time argue with Luther, especially defending Apostolic Succession in order to demonstrate that Luther was wrong?